Facing the Street: Photo Exhibit Coming Up! I’ve been busily working away with Chris Miner, my co-curator, Anne Lougheed, production manager, and Vince Perez, designer, to get this fabulous show together. Let me tell you a bit about it, to whet your appetite — though we don’t want to give it all away because we want you each to discover it and experience it your own way. Think of it as a lo-tech, hi-concept community history version of Pokemon Go? 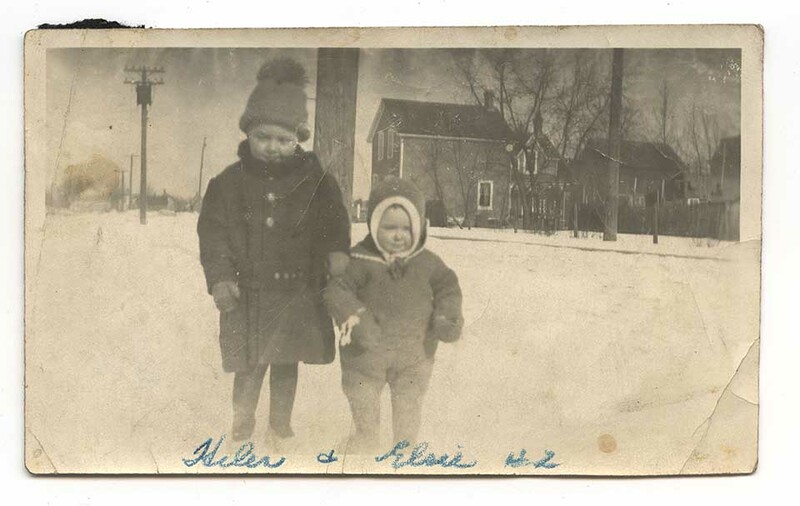 There will be a map — available when the show goes up on this website, at the Elm Café, and in the centre of Skeleton Park — and you can wander where you will to see some or all of our twenty photographs of people who lived in this area between the 1890s and early 1960s. Say hello, turn around, take a look, and orient yourself in time and space. Then when you need a little rest or pick-me-up, head over to the Elm Café at Charles and Montreal and have a cup of tea and maybe a sweet while you encounter more former residents of the Swamp Ward. The show — both outdoor and indoor parts — runs June 5-30. The Elm Café, at 303 Montreal Street, is open 7-5 Tuesday-Friday, and 8-3 Saturday and Sunday. A celebration of those who shared their photographs, lawns, fences, or stories for the exhibit will be held there on Sunday June 10, 1-3 pm, and is open to the public. The idea of this show is to provoke us to think about the lives others lived where we now live. Our show only represents a few people. Those who lived here before the advent of photographs, who were not photographed, whose families left, whose descendants did not keep their photographs, who felt uncomfortable going public, who didn’t get around to getting back to us (ha ha), or who simply have not come to our knowledge — you aren’t going to see them or their families. But we hope that in seeing a few striking faces young and old, you will have an occasion to imagine and honour others as well. It seems to me that connecting with the past — or recognizing our broken connections with it — is key to being responsible to the present and the future. It makes us think about our place as a shared place, and reminds us that we have to look after it for those who come after us. But beyond that serious stuff, this will be a fun show as well. You will see a lot of smiling and proud people. People with their arms around each other. People holding babies. People in love. People dressed up. And you’ll get to look them in the eye and imagine them laughing to see you there, on their street. It will also be a beautiful show. We don’t know who most of the photographers are, but man, they were good! Chris Miner and Vince Perez have reproduced, enlarged, and presented their work with full respect for the photographs as both art and artifact. Every rip, fold, or annotation tells a story of somebody who looked at or cared for the photo. It is not only originators who are important, after all, but those who keep, remember, and share. These two tadpoles are standing in front of their house on the west side of Patrick at James. The house you see behind them is 155 Patrick, on the east side just across from St. Pat’s School. But at the time this was taken, St. Pat’s wasn’t there: instead Robert Wallace ran a quarry there. And the Wallace family lived essentially in the quarry, in a big stone house. It was Robert and his wife Nellie, their kids (eventually five girls), Robert’s mother Isabella, and some of his adult siblings. You’ll see more photos of the Wallace family in the show, because Isobel (Wallace) Gordon — the fourth sister — has saved photos and stories very carefully, and was willing to share them too. If you listen to the World War Two episode of Stories of the Swamp Ward you’ll hear her talking about her experience of the war, at sixteen, with three older sisters in the house. Elsie and Jean married New Zealand men who came to Kingston to train with the Fleet Air Arm — and on a trip in a flying boat to visit them after the war and reassure their mother they were OK, Helen met and married her own charming New Zealander. But at this point she’s just a little bundled one in the snow, with the hydro poles marching northwards only gesturing at the world beyond her front lawn. So get your walking shoes ready, and watch this space for more information by June 5. The show is only on till the end of that month, but we hope you will get a chance to encounter it more than once, perhaps with friends and family — and perhaps with strangers who will no longer be strangers after you talk with them. Next Next post: Take yourself for a walk and see who you meet!